I’ve been making extra payments on my mortgage for the past 4 years and let me tell you, it is tough mental exercise to stay motivated while paying off the house. Paying off your house is typically the most expensive undertaking you will go through and the time line is so long that it takes a lot of mental fortitude to stick with it. Having a goal and defined action steps and mini-goals along the way is the most important method of staying motivated while paying off the house, or for any other goal. Change “I would like to pay off my house early” to “I will pay off my house in 10 years by paying $600 extra every month, which I will get by earning $400 through extra hours at work and by saving $200 by cutting expenses that I don’t need including gym membership, eating out, and cable.” Goals need to be clearly defined, have action steps, and have a time line. 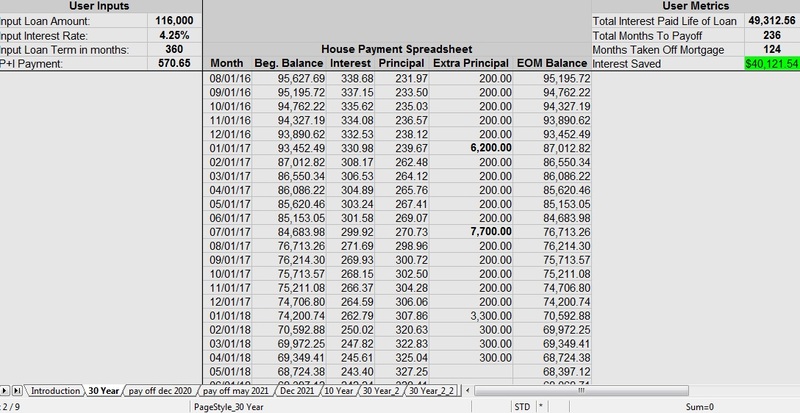 Using my House Payment Spreadsheet I can enter in a different amount of extra principal payment each month. The spreadsheet automatically calculates how much interest I have saved so far over the life of the loan, and how many months I have taken off the mortgage. With our efforts over the last 4 years we have taken over 124 months off of our mortgage and saved $40,121 in interest! When I use this spreadsheet I also create 3 more tabs that project when I will pay off the house using an aggressive, moderate, and slow approach. This helps me keep my “gazelle intensity” inline. Over a goal that spans almost a decade you WILL have financial setbacks. There will be down years and it is important to be flexible. Knowing that just because I came up short of my goal on a few extra principal payments I won’t totally miss out on the big goal is important. It isn’t the end of the world if it takes me 11 years to pay off my house instead of 9.5 years. Being able to adjust the numbers are run future scenarios helps me stay motivated while paying off the house. You can download this spreadsheet using the link below. What if you came on hard times and not only could you not pay extra on the house anymore, but the mortgage payment itself became a large struggle? I like to see what I could refinance my house to using current rates. Our current mortgage balance is $67,371, down from $116,000 when we bought our house in 2011. On a 30 year 4.5% loan our payment would drop from $570 to $341. On a 20 year 4.38% loan our payment would drop from $570 to $422. On a 15 year 4.125% loan our payment would drop from $570 to $503. For me I like the peace of mind that comes with knowing from a cash flow perspective I have an option to greatly lower my house payment if I needed to. I seriously doubt I will need to do this, however it is good to know the option is there. With what we are paying per year extra on our home I could replace my $500 car with a really nice car, and have enough money left over for a giant vacation to Disney World. Every year. There is a ton of things I could think of to do with roughly $16,000 per year. I try not to think of the money as something I could spend elsewhere. I look at my projected payments the same as I look at my actual mortgage payment; that these are required expenses, not optional. I want to have a paid off house by my 35th birthday. This is decades before most people are debt free. Achieving this milestone is important psychologically, but you don’t get a trophy for being “first” to buy a house, or first to pay off the house. I am not doing this for a status symbol, however it is a status symbol I much prefer to a new shiny car, and the daily sermons of The Dave Ramsey Show with the intro of “Welcome to the Dave Ramsey Show, where debt is dumb, cash is king, and the paid off home mortgage has taken the place of the BMW as the status symbol of choice” have certainly had an impact on my motivation. The true end goal: Yes I have a solidly defined goal of paying off my house, with a time line and action steps of how to get there, but this is only 1 part of the BIG overall goal: I want to change my family tree, and paying off my house before my kids finish high school is a major step in that direction. With $16,000 of extra payments per year on my house I am paying a total of $22,840 towards my house. Once it is paid off, this cash flow is freed up for other goals, including helping my kids get off to a sure footing in life. Reward yourself for hitting certain milestones, whether it is X amount of months paid off, X amount of interest saved, or hitting a certain balance, it is important to reward yourself for the wins and celebrate these wins with your family. Once we hit. 58,000 we will have a small celebration as we will have paid off half of our mortgage. What strategies have you used to stay motivated while paying off the house? 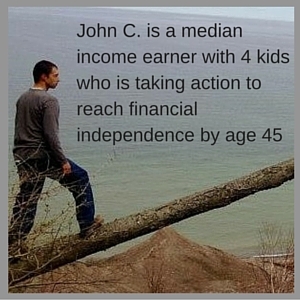 5 Responses to "How To Stay Motivated While Paying Off The House"
Inspiring post, John C. Way to play the long game. Once your house is paid off, would you put that equity to work somehow? Or just leave it be? Not sure how I would put my home equity to work, what possibilities do you know of? The only situation I can think of being able to put it back to work is using a HELOC on my primary residence after paying off the house to fund the down payment on my neighbors house, if he ever lists it for sale. Most likely we will have enough cash for a down payment by then so we won’t need to do this, but that could be one way of putting the equity to work. We would then pay that house off in roughly 5 years. Our neighbor’s house is worth about half of what our house is and would be nice to have for several reasons: It creates a larger buffer between neighbors, has a large outbuilding and a proper basement, and would be a good stepping stone for our kids for independent living after high school. My oldest son has some learning difficulties and it may be advantageous for him to start out living next to us when he is grown. Yes a HELOC to purchase an asset like real estate. Although I was thinking a rental unit. I suppose if you ended up buying the neighbor’s house you could always rent it out if your kids don’t use it, or when they’re through using it. Yeah, I won’t be using a HELOC to buy rentals, We had a pretty bad experience with rentals a while back and that isn’t a road we want to go back down. It will be nice to be completely debt free. It actually takes discipline for one to stay committed to paying his debt. Mortgage is even better as you can see what you are paying the money on. Imagine paying off credit card debts incurred on something that have been totally consumed. For mortgage loan, one can easily stay motivated by keeping the end goal in mind. Once you pay off the mortgage, the property becomes truly yours.